Jeffrey Karoff's CaveDigger tells the story of one of those rare individuals who has lived life on his own terms. Ra Paulette is much more than a cave digger. 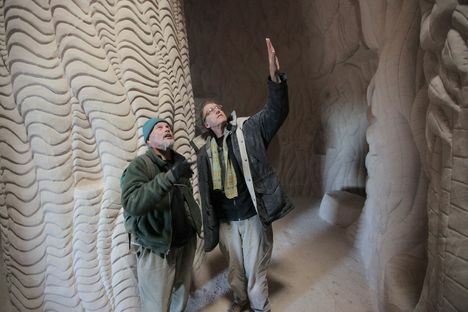 He is a sculptor who creates spiritual environments from New Mexico's lithified sand dunes, commonly referred to as slickrock. Lithified dunes were ancient marine or aeolian dunes that have become compacted (consolidated) and hard, the perfect medium for Paulette's structures and their ornamentation, which is at once elaborate and austere. Using only hand tools, and a wheelbarrow to cart away the excavated sand, Paulette carves out the dunes intuitively, driven by his deep-seated need for creative expression. The documentary does not romanticize. There have been more than one disgruntled patrons, and Paulette's wife, who has borne the brunt of earning their living, admits she sometimes longs to pursue her own creative life. Still, it is hard not to admire Paulette's single-mindedness and his unwavering commitment to his vision. "Manual labor is the foundation of my self-expression," he says. "To do it well, to do it beautifully, is a 'whole-person' activity, engaging mental and emotional strengths as well as physical strength. When digging and excavating the caves I break down all the movements into their simplest parts and reassemble them into the most efficient patterns and strategies that will accomplish the task while maintaining bodily ease. Like a dancer, I 'feel' the body and its movement in a conscious way. I'm fond of calling this 'the dance of digging,' and it is the secret of how this old man can get so much done." In Facing Fear, Jason Cohen recounts a story of what can only be called a bizarre reunion. As a gay 13-year-old, Matthew Boger was a hustler on the streets of LA. One night a group of neo-Nazis targeted him with what they thought was a fatal beating. Twenty-five years later, in a chance meeting where he is working at the Museum of Tolerance, Boger meets the man whose savage final blow was meant to take his life. Tim Zeal describes the doubts that began to haunt him and that ultimately led him to a transformative self-examination. At the Museum's behest, Boger and Zeal reluctantly presented their story at a forum -- an unlikely collaboration that continues and from which has grown an abiding friendship. Sara Ishaq's Karama Has No Walls is an eye-witness account of the Friday, March 18, 2011 uprising when crowds of peaceful protesters, who had gathered in Change Square to demand Yemen liberation from a barbaric regime of 33 years, were fired upon by pro-government snipers leaving 53 dead and hundreds injured. Two cameramen were there and chronicled the day that became a turning point in Yemen's political history, sparked national outrage and inspired international sympathy. The day has come to be called Juma'at El-Karama, the Friday of Dignity. 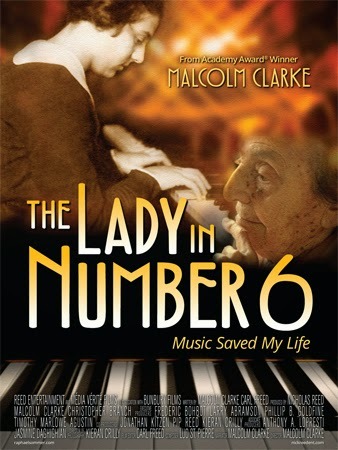 Alice Herz Sommer is the oldest living pianist and the oldest Holocaust survivor. 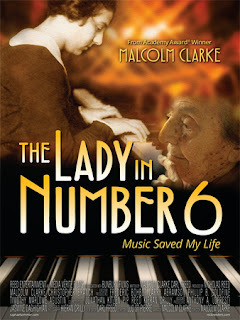 She is 109 and the subject of Malcolm Clarke and Nicholas Reed's The Lady in Number 6: Music Saved My Life. The subtitle is not meant metaphorically or poetically. It is quite literal. Alice grew up amongst the likes of Gustav Mahler, Franz Kafka, and Max Brod -- friends who visited her parents often. She studied at the Prague German Conservatory of Music and was becoming an established concert pianist when the Nazis invaded Czechoslovakia in 1939. Because of her talent Alice was sent to Theresienstadt, the camp the SS would hold up to Western governments and the Red Cross as a model of the kinds of "cultural communities" to which Jews were being sent. Footage remains of a film the Nazis had in production, apparently to use as a propaganda piece, though it was never completed. Israeli director Yael Hersonski's 2010 documentary, A Film Unfinished, is an eerily haunting bird's eye look into the camp. More than 33,000 Jews died at Theresienstadt, Sigmund Freud's sister Esther, the psychotherapist Josef Breuer's daughter Margarete Schiff, the composer Zikmund Schul, and the German classical scholar Friedrich Munzer among them. It was not Alice's musical talent alone that saw her through her brutal ordeal. Her spirit is indomitible and is as joyous and full of grace today as it must have been then. Jack Hall served his country in World War II, an experience that drilled killing into him. Stateside, after the war, he killed a drug dealer for hooking his son. Edgar Barens's Prison Terminal: The Last Days of Private Jack Hall finds Jack Hall with terminal cancer in one of America's oldest maximum security prisons where he has spent his days since. 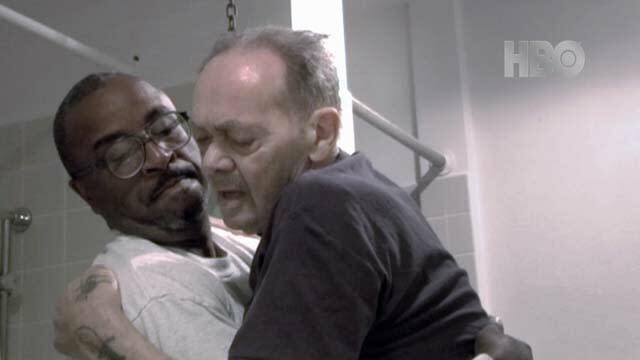 Twenty percent of America’s prison population is elderly, the film tells us. In the next decade, nearly 100,000 inmates will die in their cells -- alone. In 2005, Iowa State Penitentiary created a hospice program to care for dying inmates. Jack Hall is able to face his final days with the assistance of the hospice care providers who are themselves prisoners. The film forces us to confront preconceptions about transgressors and their ability to transform themselves. Jack is supported by more genuine love and caring than many of us who have never seen the inside of a prison will likely experience as we shuffle off this mortal coil.